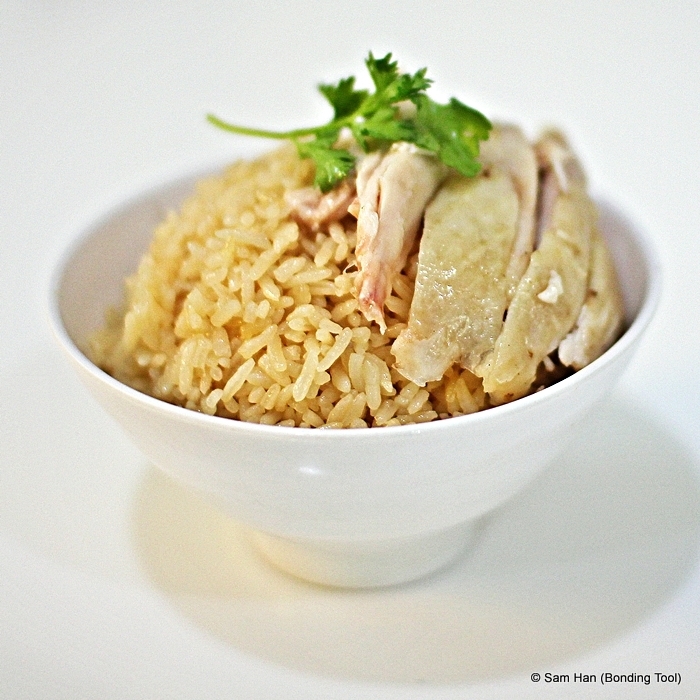 HCR - Hainanese Chicken Rice. 1 large whole bird Chicken about 1.2kg to 1.5kg (Free range if possible). 4 stalks Scallions (tie 2 stalks into a knot so you have 2 portions). 1 huge knob Ginger, peel skin and lightly bashed (divide into 2 portions). 1 whole bulb Garlic, peel skin and lightly bashed (divide into 2 portions). 1 tablespoon Salt (and more for washing the bird). English Cucumber, sliced thinly, optional. 1. Bring a big pot of water (enough to cover all of the chicken when immersed) to the boil with 1 tablespoon salt, one portion each of the ginger, garlic and scallion. 2. Rub some salt onto the skin of chicken when washing to rid smell and slime. Make sure the cavity is washed really well as bloddy inside ruin the chicken broth. Rinse well and drain on a colander. 3. Put one portion each of the bashed ginger, garlic into the cavity of chicken. Stuff one portion of the knotted scallions to prevent ginger and garlic from slipping out of chicken cavity. 4. Gently lower chicken breast side up into the boiling water and dip the chicken into the boiling water and lift it up again so that the hot water runs through the chicken cavity. Do this three times to ensure any remaining blood, if any, is washed out of the chicken. Skim the broth scum as they float on the soup later. 5. Reduce heat and let the chicken simmer in the hot water (not fast boiling, rather simmering hot), covered and cook for 20 minutes. Turn chicken breast side down and continue to simmer for another 20 minutes. 6. Turn off fire and let chicken sit in the hot water, covered, for another 30 minutes. 7. Remove chicken from pot. Brush chicken with 1 tablespoon sesame oil then put on a rack or plate to rest for at least 10 minutes. Keep this chicken broth for soup and cooking rice. 8. When chicken is cool enough to handle, cut into bite-size pieces and arrange on a plate. 9. Mix half tablespoon sesame oil, 1 tablespoon light soy sauce and 2-3 tablespoons clear chicken broth in a bowl and drizzle some of it onto the chicken before serving. 10. Serve with Ginger Green Onion Sauce. 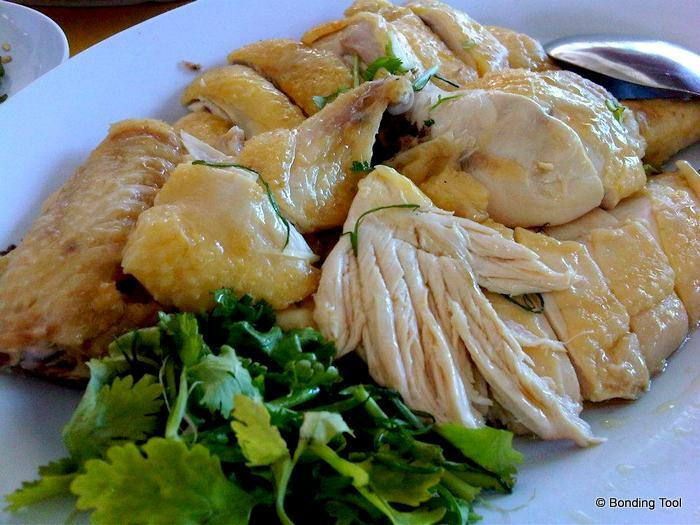 Tip: Malaysians chefs boil their chicken with fresh tumeric in the stock to produce a deep yellow skin. 50g Red Chillies (deseeded, if do not like too spicy). 10g Chilli Padi (deseeded, if do not like too spicy). ½ cup Chicken Broth (from the stock you boiled the chicken, keep hot). 2 tablespoons Lime Juice (small calamansi limes not those used for Tomyum). 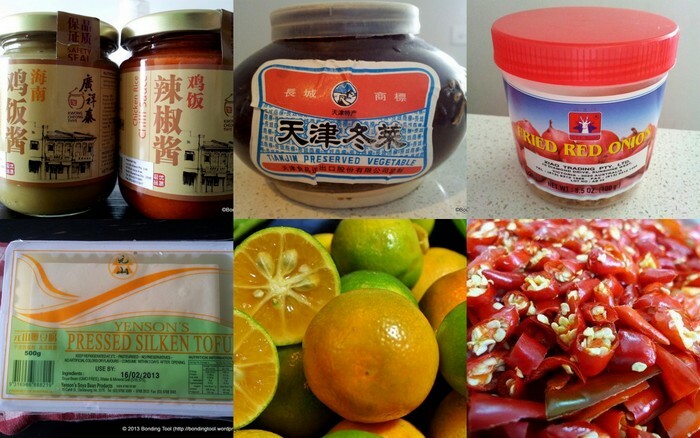 1 teaspoon White Chinese Vinegar. 2 teaspoons Sugar (more if needed, adjust to your liking). Salt, to taste (as the chicken broth is already salted). 1. Pound both chillies, shallots, garlic and ginger in pestle and mortar or use electric blender and blend till fine. 2. Put pounded/blended ingredients in a big bowl and pour hot chicken stock into the bowl. 3. Stir in the remaining seasonings and leave aside to cool for at least an hour before using. Can make in advance, store in sterilised jar and keep in fridge for up to 2 weeks. 3 cups Long Grain (Old Crop) Thai Jasmine Rice, wash till water runs clear and drain in colander till dry about 15 minutes. 2 tablespoons Oil (rendered from fresh Chicken Fats by cooking them in a dry pot – or you can skim them from the top of the chicken broth – or vegetable oil). 4 Shallots, sliced thinly or chopped finely. 4 Garlic, sliced thinly or chopped finely. 3 pieces of Pandan Leaves, bundled. 1 stalk Lemongrass (use bottom white part, bashed lightly to release essential oil). 3 cups Chicken Broth (more if needed depends on how old the crop is). Salt, to taste (the broth should be just salty enough so rice is fragrant). 1. Heat the wok with the chicken fats oil or vegetable oil, and stir-fry the shallots and ginger for a minute. Add garlic and stir-fry till lightly browned. 2. Add the drained rice and fry for 3 minutes, or till rice is coated with the oil and moisture is gone. 3. Transfer to electric rice cooker, add in the pandan leaves, lemongrass and chicken broth. Adjust salt to taste. 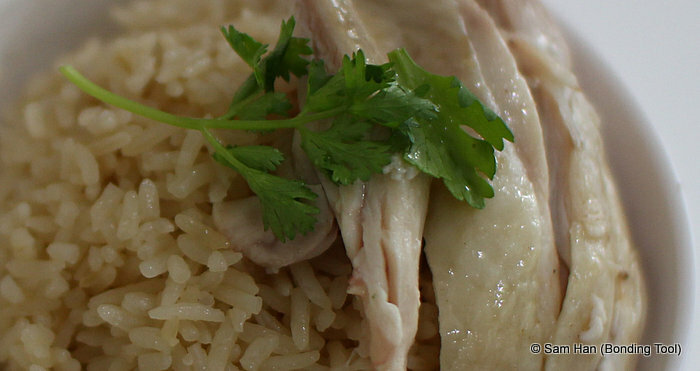 Tip For Lazy Way: Cook Chicken Rice as you would cook plain Jasmine rice but instead of using water, use the chicken broth and add salt according to taste. Throw in some garlic and ginger paste (see instructions from bottled ones for chicken rice bought from supermarket or Asian grocers), fried shallots, a bundle of pandan leaves and 1 stalk bashed white portion of lemongrass. If using this style, let rice sit in the stock for half an hour before turning on the rice cooker. The rice will look paler than the one that has been fried in the method given above. It is also not as oily. 1 tablespoon Preserved Winter Vegetables, rinse briefly and squeeze dry. (If you don’t mind the initial pungency, no need to wash). 1 box Silken Tofu, cut into small cubes. White Pepper Powder, to taste. Some Spring Onions, dice finely. 1. Heat the chicken broth that you have cooked the chicken in. 2. Add in the rinsed Preserved Winter Vegetables and boil till the vegetables doubled in size and the soup becomes infused with its saltiness and sweetness. 3. Remove the vegetables with a perforated ladle (you can leave them in if you like to eat them – I take them away as my children do not like). 4. Add in the cubed tofu and adjust salt and pepper to taste. Limes and Chillies Photo credit: Google Images. 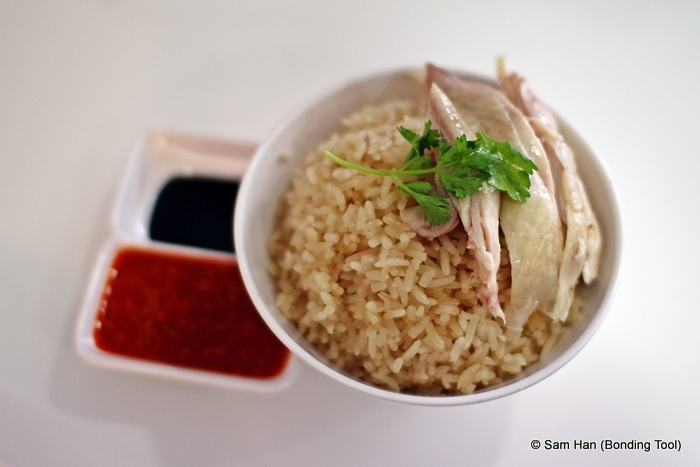 Chicken Rice - chosen as food that best represent Singapore!